Amazon Reviewer wrote: Some say that this book, found in a safebox in the port area of Kowloon, was dictated, because Bronze Age Pervert refuses to learn what he calls "the low and plebeian art of writing." It isn't known how this book was transcribed. The contents are pure dynamite. He explains that you live in ant farm. That you are observed by the lords of lies, ritually probed. Ancient man had something you have lost: confidence in his instincts and strength, knowledge in his blood. 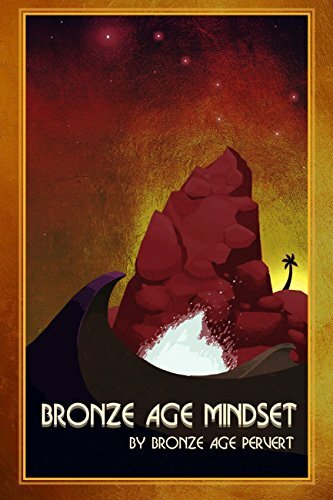 BAP shows how the Bronze Age mindset can set you free from this Iron Prison and help you embark on the path of power. He talks about life, biology, hormones. He gives many examples from history, both ancient and modern. He shows the secrets of the detrimental robots, how they hide and fabricate. He helps you escape gynocracy and ascend to fresh mountain air. Amazon Customer wrote: ...to be fair, you have to have a very high IQ to understand Bronze Age Mindset. The humour is extremely subtle, and without a solid grasp of Vedic philology most of the points will go over a typical reader's head. There's also BAP's Nietzschean outlook, which is deftly woven into his characterisation- his personal philosophy draws heavily from Japanese nationalist literature, for instance. The fans understand this stuff; they have the intellectual capacity to truly appreciate the depths of these arguments, to realise that they're not just funny- they say something deep about LIFE. (Namely, that you are GAY). As a consequence people who dislike Bronze Age Mindset truly ARE bugmen - of course they wouldn't appreciate, for instance, the humour in BAP's existential catchphrase "Socrates was a N****R" which itself is a cryptic reference to Kantbot's esoteric epic Tren Warriors. I'm smirking right now just imagining one of those addlepated simpletons scratching their heads in confusion as BAP's genius wit unfolds itself on their Kindle screens. What fools.. how I pity them.